Every book starts with a great idea - a figment of the author's imagination. That's how Flexible Fred was born too! But the fun didn't stop there. Read on and discover how a late night run for donuts launched a three-year process toward publication. Tons of ideas (even the lame ones) all get scribbled down. Word count, vocabulary level, and meter are just some of the elements the writer takes into account. Countless drafts later, the story and characters for Flexible Fred will become a rich and immersive reading experience. A fresh eye can do wonders. That's why getting objective feedback is such an important part of the writing process. Flexible Fred went through numerous formal critique sessions over a three-year period before it was deemed ready for submission to various literary agencies. The one constant is change, and the creative process holds no exception to that philosophy. Feedback is carefully considered before plunging into more drafts. Flexible Fred was shaped by a series of continual revisions, over and over again - kind of like making a diamond. As a picture book, Flexible Fred was assembled into a rough mock-up called a dummy. It's actually much smarter than it sounds. Loose sketches are included with the text to provide a better glimpse into story flow and page layout. A picture is worth a thousand words. That's one of the reasons why a book like Flexible Fred can be challenging to produce. Exploration, patience, and lots of play allow the artist to create just the right illustrations that will complement the story being told. Once the final artwork is complete, Flexible Fred goes through its final stages of preparation. Subtle details, ranging from paper weight to cover design, are carefully factored into the look and feel of the finished product. Time to see how all this hard work is actually going to look on paper by thoroughly checking the proofs - because once you publish, there's no going back. Your work is truly there forever. 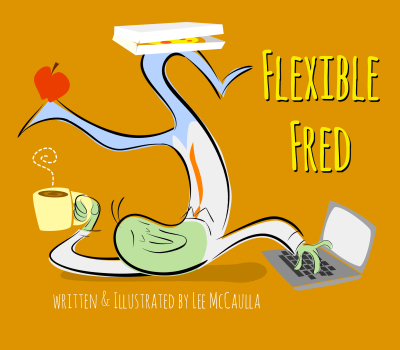 The proofing process for Flexible Fred took two months before moving on to the final stage. Flexible Fred is printed and bound with the finest, environmentally friendly materials available. Every fiber of the book is FSC Certified, completely non-toxic and contains recycled content.